She was in over 30 films, half of which she starred in a leading role. 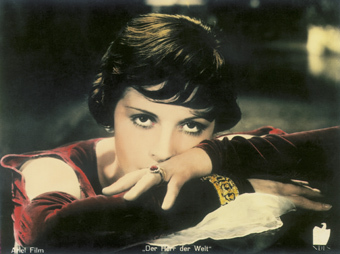 She had prominent partners such as Hans Albers, Heinz Ruehmann or Gustav Gruendgens: the actress Sybille Schmitz was considered the most beautiful face in German cinema during the 1930s. She was an exceptional figure, whose austere charm elevated her above the smooth salon ladies and the dance-crazy revue girls of the times. But she was also an outsider, with an air of mystery and melancholy. Her life was an enigma, particularly her fate after World War II and the circumstances of her suicide in 1955, which led R. W. Fassbinder to his film Die Sehnsucht der Veronika Voss. Based on Friedemann Beyer's biography Schoener als der Tod - Das Leben der Sybille Schmitz (Belleville-Verlag), the film portraits the myth of Sybille Schmitz, showing the different phases of her life through interviews with relatives and colleagues and clips from her most important films. Achim Podak was born in 1967 in Stuttgart. He works as a television journalist for several leading German TV-cultural magazines, including ARD-Kulturweltspiegel, Kulturreport, Titel, Thesen, Temperamente as well as for the German-Austrian-Swiss broadcaster 3Sat's Kulturzeit. He has also done several feature productions for the German public broadcaster ARD and ARTE. Film, literature and cultural politics are the main focus of his work. In 2000, he directed the documentary Dance with Death - The Ufa-Star Sybille Schmitz (Tanz mit dem Tod - Der Ufa-Star Sybille Schmitz).